Now managing Paris Saint-Germain, the 45-year-old German coach has a wealth of experience in youth coaching having developed with clubs such as Stuttgart, Mainz and Augsburg, before moving to Borussia Dortmund and, during the summer, to PSG. While he was manager at Dortmund in October 2015 he was invited to speak at the Aspire Academy Football Performance and Science event and he was asked about his approach to youth training and he revealed the one thing that he would do now if he went back into youth coaching. Although the interview is exactly from three years ago, it’s still pertinent today and worth considering for any coaches who might just be making life for their players too easy. Tuchel said: “To me football is an absolute team sport and that’s why you can not train individually only to a certain extent. Of course we have specific exercises for forwards and defenders, but that is just a small part of the overall training. “But I am a fan of practicing everything in a very complex way and always having the team together. “It is not really a philosophy. I have just not found a simple way of practicing with the forwards or the defenders on their own. And then just putting them together on the weekend. Tuchel is convinced that problem solving is the way for players to develop and believes making things easy for young players can have a detrimental effect. “Talented people are good at solving problems, and if I were to go back to being a youth trainer now, one thing I would tell youth coaches is that they make the life for their talents as difficult as possible. Because overcoming obstacles is the most important thing for talented players,” said Tuchel. “Investing in the youth is very good and the establishment of academies contributed a lot to the current success of the German national team. It’s great we can offer them these great possibilities at academies, but putting them in this comfort zone also comes with a big risk. “The effect could be that something is missing, the skill to overcome obstacles. “Who is able to overcome obstacles? Who is able to perform even if the locker room does not have air conditioning? “Who can perform if the laundry is not done automatically or if his transport to training is not arranged and if he has to organize it himself? “Where are the hidden talents of the players beside the ones that are obvious? Tuchel is well aware that some of the game’s brightest talents may well have just inherited their talent, but he still believes challenging even these players is the way forward. Tuched added: “I was coaching national team players like Sami Khedira. Andi Beck and Serdar Tasci when they were playing in my U15 team. But maybe an amateur could have coached them and they would have come professional players. “Who can say to what extent I had a part in their development? 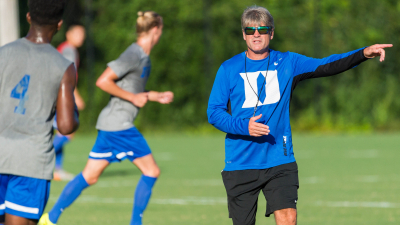 GoPlay Sports recently caught up with Duke men’s soccer head coach John Kerr to ask him about his recruiting process. Kerr, who was on a whistle-stop trip to the United Soccer Coaches Convention in Chicago, revealed he was en-route to Florida to take a look at some players at the US national team camp. “We’re a worldwide university to so we recruit from all over the place. We have nine foreigners on our team we’re lucky enough to have the pick of the top foreign players and the top domestic players in the United States,” said Kerr, who is in his 12th year with the Blue Devils. “Everywhere. Anyone that available and is interested in our school and has the right academics. We figure out their playing profile and do research on them. How detailed are the profiles? “It’s very deep, it comes from their academic transcripts. Recommendations from their teachers and playing videos etc. And then if I see a guy in a video I really like I will go and see him in person. “The first thing we do is see if they can qualify academically – that’s first and foremost and then after that I try to work out whether they are a good footballer and make good decisions on the ball. Are there any major differences in the foreign recruits to those from the US? “Usually the foreign guys from professional clubs are very savvy and understand the game and they come from a culture where it is understood that every single day you are going to play or watch or listen to a coach who is going to help you. What benefits do the US students get from mixing with international students? What do the international students think of the US game? “Sometimes they don’t know how physically demanding it is and it is taxing for them when they play more than one game a week. In America in the college season we’re playing three times a week and that is difficult to get used to initially. “Then there’s the daily grind – it’s hard work to play, recover, play, recover, so they have to adapt to the US system. “I’m going down to Florida to watch the national team play. They have a camp down there with the U19s and U20s.